Florida Green Building Coalition (FGBC) – Free Guidelines for building or remodeling homes and inexpensive certifications. US Green Building Council (USGBC) – Probably the most well-known international third party certifications available. American Council for an Energy-Efficient Economy – leading center of expertise on energy efficiency with a reputation for quality, credibility, the applicability of our work, and our bipartisan approach. Environmental Protection Agency:Design for the Environment – helping consumers and industrial purchasers make wise choices by identifying safe and effective products. Eat Well Guide: A great website for finding healthy restaurants, CSAs, Farmers’ Markets, bakers, catering services, organizations, etc. Just enter a city or zipcode to locate places to eat well when you travel. Environmental Working Group: The mission of EWG is to use the power of public information to protect public health and the environment. This is by far the best resource I have found to research the toxic chemical ingredients of food you eat or products you use. GRACE Communications Foundation: A group that highlights the interconnections of food, water and energy, educating consumers, advocates and policy makers through our web-based initiatives: Sustainable Table, Eat Well Guide, The Meatrix, Network for New Energy Choices, H2O Conserve and the Ecocentric blog. Union of Concerned Scientists: Citizens and Scientists for Environmental Solutions – UCS combines independent scientific research and citizen action to develop innovative, practical solutions and to secure responsible changes in government policy, corporate practices, and consumer choices. Climate Counts – Business has the power to change the world – and you have the power to change business. Is your favorite company stuck, starting, or striding? American Lung Association – the leading organization working to save lives by improving lung health and preventing lung disease through Education, Advocacy and Research. Environmental Working Group (EWG) – By far my most often visited website to check the toxicity of products, i.e. sunscreens, make-up, shampoos and many other items. To help support EWG I shop at Amazon.com through their portal at no additional expense to me but a contribution to them from Amazon. FFL’s Plant Database – A great website to locate the right plant for the right place. Divided into regions based on the USDA Hardiness Zone map find details and pictures about suitable plants, shrubs, ground-covers and trees. Interactive Yard Tool – This online tool will take you through the steps needed to transform a yard dominated by lawn into one featuring beautiful beds with Florida-friendly plants and Florida native plants that require little or no fertilizer or irrigation. 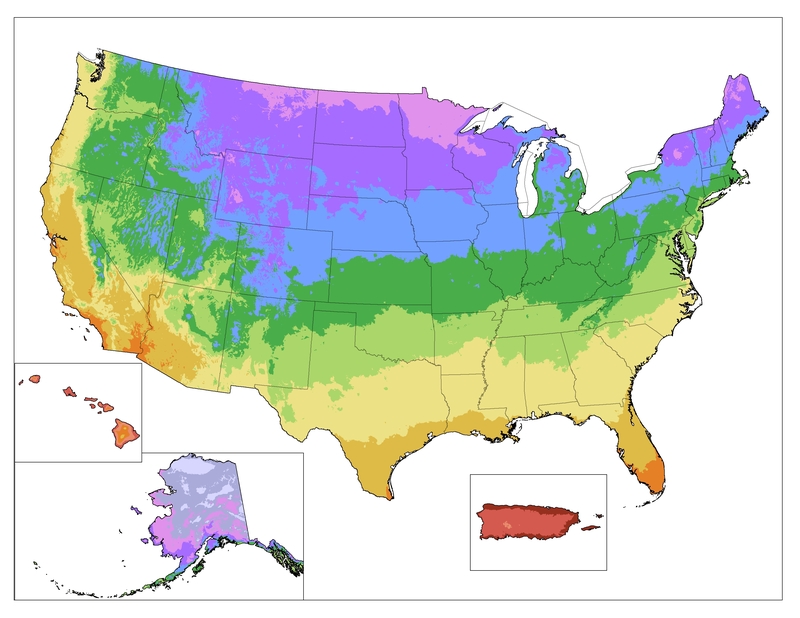 USDA Hardiness Map: The new USDA hardiness map showing planting zones in the United States. Radio Green Earth – an award winning weekly program produced for Public Radio focusing on environmental education. Podcasts of previous shows are available. Florida Bed And Breakfasts For Sale – my website showcasing bed and breakfasts for sale throughout the state. Also articles on greening your inn. Green Florida Properties – my real estate website featuring Energy-efficient homes and services. Also search the Multiple Listings for properties. HGTV’s Front Door: Green Real Estate – Remodeling ideas, tips and articles on green living. Department of Energy – The Weatherization and Intergovernmental Program provides grants, technical assistance, and information tools to states, local governments, community action agencies, utilities, Indian tribes, and overseas U.S. territories for their energy programs. (DSIRE) Database of State Incentives for Renewables & Efficiency– a comprehensive source of information on state, local, utility and federal incentives and policies that promote renewable energy and energy efficiency. 101 Cookbooks – Heidi Swanson – my favorite natural cooking blog-site with great recipes and stories. Earth911 – find a recycle center near you for e-waste or hard to recycle items.